There are two Casella cycles in train, one from Gianandrea Noseda and the BBC Philharmonic (Chandos) the other from Francesco La Vecchia and the Orchestra Sinfonica di Roma (Naxos). Both have yielded some marvellous performances of works that are, in general, of good quality and should be far better known. That’s certainly true of the three symphonies; late Romantic in spirit these are big, bold pieces that speak with a very individual voice. As for Casella’s more peripheral output it’s rather more variable; it’s still worth hearing, especially when it’s so passionately promoted by conductors and ensembles of note. We start with extracts from Le Couvent sur l'eau (The Convent on the Water), a so-called Comédie chorégraphique penned in collaboration the French writer Jean-Louis Vaudoyer. As Gerald Larner points out in his liner-notes Diaghilev rejected the piece, from which Casella then created this five-movement suite. The opener, a parodic Marche de fête (Feast-day March), certainly gets a vivid outing here. Listening blind one might be forgiven for thinking it a superior piece of film music from the 1940s or 1950s. Still, it’s played with commendable brio. The recording seems adequate rather than outstanding, but more on that later. The Ronde d’enfants (Children’s Round Dance) is a bright, rather brisk little number that finds the BBC Phil in highly virtuosic mode. It’s not Casella at anywhere near his best, and it seems a little unwieldy at times. The third movement is in two parts, a Barcarolle and a Sarabande, both of which are winningly played. What a pity, then, that the Barcarolle is spoilt by soprano Gillian Keith’s unseemly vibrato. As for the darkly sonorous Sarabande it demonstrates Casella’s skill at investing older forms with a contemporary warmth and amplitude. Despite some clever touches – such as the tune for two harps, glockenspiel (four hands) and celesta in the gently humorous Pas des vieilles dames (The Dance of the Old Ladies) – I’m left with the distinct impression that this is Casella-lite. The two-part finale, made up of a Nocturne and a Danse, rather confirms that view. Still, it’s attractive music well played. As for the recording I don’t feel the BBC Phil are well served by their new home at MediaCity. Indeed, I’ve yet to hear top-notch sound from this venue. The first volume in this series, recorded at Manchester’s now demolished New Broadcasting House, is in anther league altogether (review). The Elegia eroica (Heroic Elegy) was composed shortly after Casella’s return to Italy from Paris in 1915. Scored for a large orchestra it’s a powerful piece ‘dedicated to the memory of a soldier killed in the war’. I first got to know it via La Vecchia’s searing performance (review). Now this is Casella at his best, musically astute and emotionally intense. The contrast between heroic deeds (the nightmarish march at the start) and child-like tenderness (the gentle lullaby at the end) couldn't be more unsettling. La Vecchia and his Roman band are both stark and splendid here; the Naxos recording is exceptionally vivid, too. Turning to Noseda’s account I was struck by how highly strung it is; it also feels claustrophobic, and that means both depth and detail are compromised. For instance those crowning cymbals, so thrilling in La Vecchia’s version, are lost here. That said, the BBC Phil’s timps and bass drum have considerable impact, and Noseda makes the most of the score’s quieter moments. Ultimately, though, it’s a more coherent and compelling piece than Noseda would have us believe; La Vecchia’s carefully calibrated approach gets closer to the wrenched heart of this remarkable work. Also, I much prefer the latter’s recording, which is both detailed and spacious. As it happens I have La Vecchia to thank for my initial exposure to Casella’s First Symphony. Not only is the work one of my most significant ‘finds’ of recent years – the Second isn’t far behind – it’s also an early opus of uncommon skill and stature (review). And even though Casella had just enrolled at the Paris Conservatoire – Gabriel Fauré was one of his teachers – his maiden symphony isn’t remotely Gallic in character. In fact Casella dismissed the piece as a potpourri of Borodin, Brahms and Enescu. Perhaps, but such flippancy shouldn’t deter listeners from exploring what is actually a very individual and rewarding work. Having said that Noseda’s account of the first movement does suggest such a range of influences. Goodness, this is a red-blooded, very Russianate reading in which the players give their all. As before the timps and bass drum are very prominent, but some listeners may find them a tad overpowering. Chandos used to be known for their warmly expansive recordings - they could be quite fulsome at times - but I’d rather that than an intermittently visceral but otherwise unconvincing sound picture. I know these things are terribly subjective, but Chandos get far better results in Bergen's Grieg Hall - Andrew Davis's Berlioz springs to mind - and Geneva's Victoria Hall. The latter's bang-up-to-date recording set-up csn be heard in Neeme Järvi's recent OSR recordings; his Offenbach in particular sounds just wonderful (review). The lyrical, often levitating Adagio is one of the loveliest things Casella ever wrote. It’s certainly the high point of La Vecchia’s affectionate and very spontaneous performance. Predictably Noseda is stronger in the trenchant passages here and in the somewhat Tchaikovskian finale. Noseda's rhythms are more pliant than usual and he builds to a suitably emphatic close. 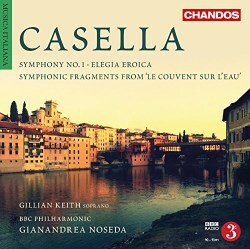 That same air of exhilaration and release attends the last movement of Casella’s Second; Noseda’s superlative account of the latter was one of my Recordings of the Year in 2010. For all its virtues Casella’s Op. 5 is not without its threadbare patches, but he more than makes up for that with writing of gentle radiance and charm. La Vecchia really brings out these qualities – it helps that his players are so utterly engaged – and that’s why he's my first choice for this symphony. Ditto his account of the Elegia eroica. Not the finest volume in Noseda’s cycle; for better performances and sound look to La Vecchia.